Age of the Gods Ruler of the Sky slot at Fly Casino just in time for summer and has been a massive hit with our members. 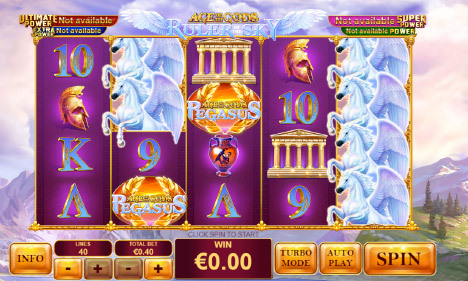 This incredible 5-reel, 40-payline slot continues with the ancient Greek mythology theme and is based on Pegasus. The highlights of the game feature stacked wilds along with the Mighty Pegasus Free Games feature where you’re rewarded with extra wilds and unlimited free spins. $150 Bonus On Sunday from 00:00GMT until 23:59 GMT, all members on their deposit of just $/£/€30 or more will receive a 75% bonus up to $/£/€150.00 bonus.